Commute times are a growing factor in people’s moves, according to new data from the U.S. Census Bureau. More than five percent of Americans who moved between 2012 and 2013 were seeking an easier commute or a home closer to their job. That means distance to work is a bigger factor than it was in 1999, when just over three percent of people said that motivated their move. It’s far from the biggest motivator for a move, though. Housing-related reasons topped the list — things like moving to a better or less expensive home. Commute times were the second-biggest factor for job-related moves, the bureau found. 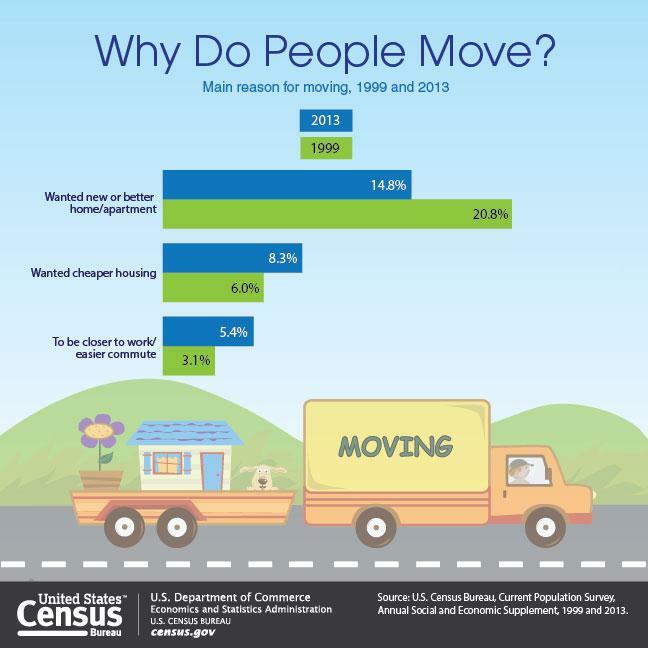 Separating reasons for a move can be tricky, cautions the report's author, David Ihrke, a demographer in the Census Bureau's Journey to Work and Migration Statistics Branch. "For instance, if one's primary reason for moving is to be closer to work or having an easier commute, they may have to sacrifice other preferences. This could include forgoing cheaper housing options or settling for a different neighborhood. If they mainly want cheaper housing, they may have to deal with a longer commute."